Keys to uncovering your Lead Generation process problem? Lead Generation is the cornerstone of any growth-oriented business. Many that we work with don’t really realize they have a problem. Let’s take a look at what works, what doesn’t, and how to get your lead generation process in shape. It’s time to close the Lead Gap. The blame for a faulty B2B lead generation process doesn’t lie solely on the marketing and sales teams. Undoubtedly, it all starts with how those teams are being managed…and the processes that have been set for generation leads. When auditing a client’s lead generation process, we often witness these managing missteps that can cause large gaps. Interested in making sure Marketing and Sales are aligned? Delegating Lead Generation to the Sales Team. While it may seem to be the logical move, this isn’t always the right way to manage your lead gen process. When you ask the sales team to create the leads and close the deal, it’s adding pressure—and paving the way for disappointment. If your team doesn’t have a set of protocols in place for the lead generation, you’re not going to be seeing a consistent level of ROI. From the aforementioned rift between marketing and sales to the loss of qualified leads, lack of process is the enemy of lead generation. By creating a set of best practices and having everyone on the same page, your program will flow smoothly, allowing for continual optimization and ROI growth. Are they providing continuity with a full campaign or are they doing a lot of one-offs, with no cohesion. Are you interested in learning more about what it takes to identify, and solve tough lead generation problems? 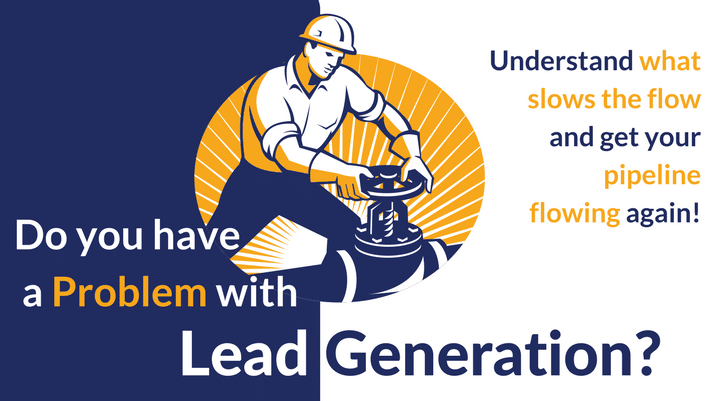 Get in touch with the Lead Generation experts to get your pipeline flowing again. We’d be happy to give you a free 15-minute phone consultation and answer any questions you may have. What are the next steps toward a bigger, better Lead Generation process? Define the Process—Whether, through an action marketing matrix or whatever tools and protocols are best for your specific needs, the process needs to be defined (and possibly created or re-created) and communicated to all team members. This ensures a healthy funnel, alignment around the process, and accountability through action and ownership. Clarify and Simplify the Roles—The ownership of each stage of the funnel needs to be clearly defined, and not made complicated. Creating a new lead generation process, or tweaking your existing one, doesn’t have to be an overwrought experience. By simplifying and specializing, you’ll have a team that is on the same page, and leads that are more qualified. Less time will be wasted, and more ROI will be earned through a pipeline that is flowing with lead generation. Take a look at these examples to see how we drove success for our clients.